This entry was posted on November 6, 2018, 3:30 PM and is filed under Fire Service News. You can follow any responses to this entry through RSS 2.0. Both comments and pings are currently closed. Thanks for remembering Glenn. No person should have to endure what he went thru after his cerebral hemorrhage. I chuckled at the remark made in the news paper article, saying he was in stable condition…..there wasn’t anything stable for Glenn from that moment on. He was fortunate to be surrounded by loving family members and an extended veil of friends in and out of the fire service, but how much could one really do for such a tragic event such as his. 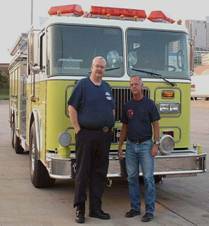 The fire service lost a true friend. He wasn’t wealthy or famous by any means, but he was living life to it’s fullest and always giving his job 100%. RIP old friend.